Do you know the feeling when your creative bug comes to visit? You just want to get your hands dirty and create something from scratch. But we all have those half finished creative projects laying around, that we didn’t quite have time to finish. Today I want to share an easy creative project that looks like it took ages, but really it’s just an hour. I’m in love with these little guys, so simple and beautiful. For this project I choose a 6×6 canvas and a 5×5 Holga film camera photo. I wanted a white border around the image, but definitely not necessary. Step 1: Spread a layer of gel medium on the canvas. Be careful to spread it thin enough and as smooth as possible. If there are thick areas you’ll end up rubbing the photo off along with the paper. Not cool! Place the photo print side down. Don’t do what I did the first time and put the photo up… 🙂 Smooth out the image and remove any air bubbles. You want the whole image securely sticking to the canvas. Let it dry overnight. Step 2: Use a spray bottle or sponge to soak the canvas. Once the paper has soaked up the water you can rub gently on the paper. I’ve used paper towels and sponges, but on small canvases it works best to just use your finger. The important thing to remember is to rub gently. The ink will rub off too, so go slow. Step 3: Once you’ve removed the majority of the paper I like to use a rough sponge to rough up the edges. Can’t have it too clean! Then let the canvas dry out for bit. Step 4: You’ll notice that once it’s dry the photo still looks cloudy with paper residue. The easiest way to rid the canvas of fog is furniture polish! The oily kind that’s just for real wood furniture works best. Pour a little on a cloth and rub it into the canvas. It clears it right up! It took me trying about 10 different products to figure that out! And that’s all there is to it! A small canvas like this one only takes about an hour of time sans the waiting for it to dry. It’s the perfect way to add some vintage to your photos! And so many ways you can add your own flare to it so experiment on your own! The larger the canvas the less room there is for error, but the WOW factor is totally worth it! I love making this! This process also works on wood! In love with this idea! This is a great idea, I have been producing image transfers on watercolour paper for my clients, love the canvas idea! This would look really nice on wood blocks if you do children’s photography too. I tried this because I loved the idea. I bought liquitex, put a thin layer on a small canvas, and put a xeroxed copy of a pic on overnight. I’ve just sprayed the paper with water (maybe too much??) It was pretty soaked… but my picture didn’t transfer. The paper maybe wasn’t glued enough(?) The whole picture wants to peal off and the inky is so watery it just looks like blotches of light ink colors on the canvas. If you used a commercial copier — like Xerox — it wont’ work because those devices use toner. You need to use an ink-jet based printer or laser printer. If it uses ink cartridges – this process should work, but anything with a toner bottle won’t work. I hope this helps! I used a xerox copier with toner and it worked great. Love this! Was wondering if you’ve noticed any yellowing after using the furniture polish. I’ve been trying to find a way to remove that fog as well and came across another tutorial that used clear sealer spray. Now I’ve seen your furniture polish suggestion and wondered which would be better! I know this reply is really late, but I’ve noticed yellowing after applying the polish and I was very disappointed with that. I may give the clear sealer spray a try since the furniture polish definitely didn’t give results I was happy with. Hello, : ) We think your idea is great and I have tried it and I have run into a problem. After I took the paper of and used the oil furniture polish what i had and it looked great, till it dried and then it looked cloudy again. Can you give me any ideas to correct it? What brand of furniture polish did you use? I would appreciate your suggestion. I love this, this is going on my MUST-DO project list!! Thanks for sharing, I can’t wait to try it! I love this! I was so excited to try it. It looks so beautiful on the site!! Sadly, the colors in my copies bled a lot and the images ate pretty unrecognizable. They definitely don’t look as nice. Any advice would be appreciated! Do you think this would work on tiles or does it need the rough surface? Would be amazing coasters!! Love this way of showing art. I have tried this before and in another tutorial they said to paint over again with the Gel Medium. 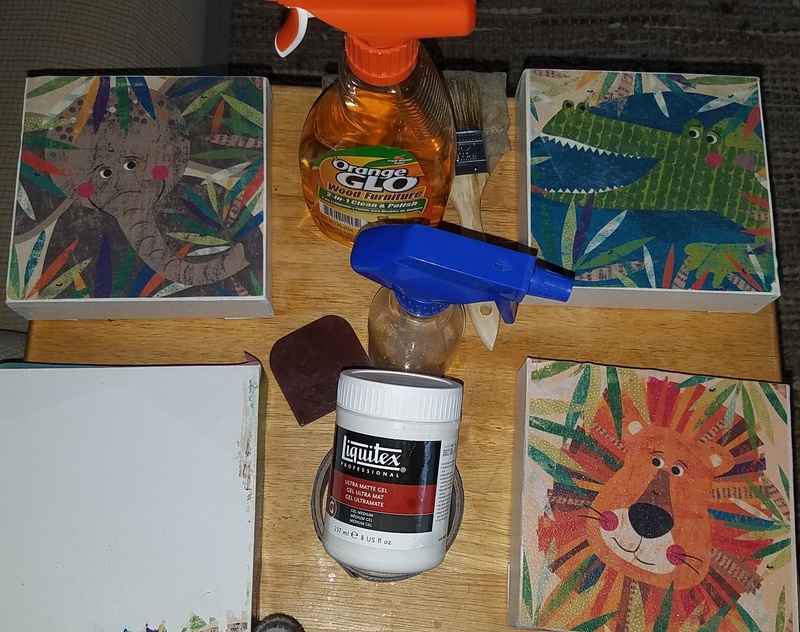 But I also get patchy cloudy areas – I will try with the furniture polish and when that is drying, paint over with the Gel Medium. I really want to get this right for my photography sales. Hello. Help. After the face down photo dried. I wet it down but the photo rubbed off too. Should I be using a up graded paper? I had cheapie paper from the market. How long to soak before rubbing? What a wonderful idea!! Any chance I could use Mod Podge in place of a gel medium for this project? I am obsessed with this DIY. I have shared it numerous times with friends and potential clients. Always love finding new ways to display photos- they are so important. Love love!! corinna from piddix shared you/this post..i’m so glad she did!!! lovely blog and great ideas! hello I’m from Argentina I could say is kind of gel using decoupage glue or glue is transparent thanks! can you use a photo instead a xeroxed copy? Does it have the same effects??? can you use a photo instead a xeroxed copy? Hi I tried this and Im not sure if Iv used the right type of photo. I used just a normal glossy one that you get printed off from the professional places like jessops etc. is that wrong? Does the photograph have to be in photo print paper? Or just an actual paper copy? If it’s on photo paper, why not just use a print from target’s 1 hour photo? Will that work? Thanks for this tutorial! I made this today and the result was incredible. Since I didn’t have furniture polish, I used a few drops of olive oil on a cotton ball instead and it worked just as well. Oh and I also used just plain white glue to stick the photo onto the canvass then diluted about a tablespoon of the same glue for the final coat at the end. I did this as it said. I took a photo down to the UPS store and copied it, blew it up a little and copied it. I glued it down with the gel matte, you actually need a little more than a very thin layer or it won’t stick down. I did a very very thin layer at first and the photo wouldn’t stick. I let it dry over night and then wet the canvas. One layer of the paper pealed right off, leaving a cloudy version of the photo on the canvas. I then used my fingers to rub off more, but it rubs off a lot of the picture. I found if you wait til the paper remnants are closer to dry than wet, they rub off without rubbing off as much of the picture, but it’s very time consuming and kind of a mess. The remaining picture is still very cloudy when dry because of the thin layer of paper. I haven’t any furniture polish but I will try the olive oil as someone else suggested, maybe even a layer of the gel matte on top. I did notice Micheal’s craft store has a canvas polish, that might work too. I LOVE this idea. I tried this using regular copy paper. It didn’t work. Should I be using photo paper? HELP! Please??? I’d love to be able to give these as gifts. I did this on two different canvases the last couple of days. The first one wasn’t very good because I didn’t put enough gel underneath the paper image but the second one was pretty. I covered the canvas with enough gel to stick the photo copied image (on home printer paper, not photo paper) face down. Put enough as though you are glueing something down normally but not so much that it oozes heavily from the sides. You must make sure though that you get out any ripples or bubbles and make it smooth. I put a heavy-ish book on top of it and let it dry overnight. The next morning I soaked a clean sponge with water and squeezed out some and put it on top to wet the paper pretty good. The print ink should be stuck on there enough that how much water isn’t so much a big deal as to how much rubbing you do. I used my finger and a paper towel which helped with the problem of accidentally transferring the darker ink colors across the rest of the picture. Just pay attention and have patience as you go along to the “furry” looking parts which will need a little more coaxing to get off. When I thought I couldn’t rub anymore without messing it up, I used some olive oil on a cotton ball to help with the hazy spots and lightly wiped any remaining with a paper towel. Then I ended up mixing glitter with my modge podge (it was for a friends tween daughter’s present) and putting a few coats on it, spread out a couple hours. I WILL DO THOS AGAIN!!!! Thank you soooo much for this awesome idea. Oh, the possibilities are endlesssssss!!! Great idea! The options – using your technique as a basis – are just endless! I am overwhelmed with projects I’d love to try. Thank you SO much!! Great idea, i thought it would be much more difficult. Have you tried printing a single photo across multiple canvases? This is fantastic. It worked perfectly. I just printed out the photos on my inkjet printer on regular white paper, did exactly what you said, and used a wet sponge. The paper came right off. I’m gonna try it on a big canvas now. So exciting! So I can’t just use a print from a regular inkjet right? Yes, you can =) I did and it worked really well! Great concept of little beauties shared by you, love this, hope to make one for me with my friends. Mine turned out very nice, after trial and error with the first 2 that I made. You were so right about rubbing softly with your fingers. My first 1 I made I didn’t let it dry overnight, big mistake. Thanks for the furniture polish trick, it worked perfect. Thank you again for such a fun canvas art project. Can you use glue or decoupage glue to put on top? This is a very good blog about canvas art…. Thanks for sharing..
hi, does this work with a laser or inkjet print rather than xerox? What a fantastic idea, I’m going to try this and make some for my family, what a lovely present to keep, great find. This is a great idea! Love the rough edges idea. Can hardly wait to do this! Thank you for sharing! Thanks for sharing, I look forward to trying this! Great tutorial and fun project so far. So I’ve done all of this and it transferred great, and I spent a good while rubbing off the paper lol (I started off with an 8×10 canvas.) after I rubbed and rubbed, I let it dry, and I had the white film over my canvas. I got some furniture polish and gently rubbed it all over the canvas. It seemed to help a little, but the white film still showed up. The polish I used is Old English. Can you or anyone reading this that has tried this project let me know what the brand or some more info on what kind of furniture Polish worked for you? 🙂 thanks and I’m so excited to see how this turns out! Love the way they turned out. I can provide the same effect via Photoshop in order to then print the photo to the extents of the canvas, giving it the wrapped feel. Such a great way to preserve the memory of such a special day. I tried this and it worked out great – until I sealed it with a final coat of luiqidex. Big bubble-looking spots appeared that were not noticable until then 🙁 Too much glue in the initial step?? I didn’t notice any other comments about this.. Next time I will try olive oil. Needs patience, but looks great!! Hello, I’m from Brazil, What kind of Gel do you use for this? Is that we use on hair? Wow, I just tried this and it looks amazing! Can’t wait to try a big canvas ???? Absolutely works beautifully!! Oh my goodness, I didn’t think it would work so well. I used Liquitex Professional Matte Gel Medium, bought it at Joann in the painting section. Thanks for this great DIY!! Can you use mod podge matte? @Miz There is another online canvas printing store where you can find cheap canvas prints named Canvas Champ. I hope it will suitable to you for pricing. Also This DIY Piece of canvas is just awesome – one should try this! There’s just something about print! Do you think I could use Modge Podge over the polish to seal in the brightness? The effect can be cloudy but I was able to brighten it back up with patience & polish. I loved this technique, only messed up one out of 4 but printing another color copy to do over is easy. Plan on doing 6×6 month by month baby pics for 1 year old birthday wall art.